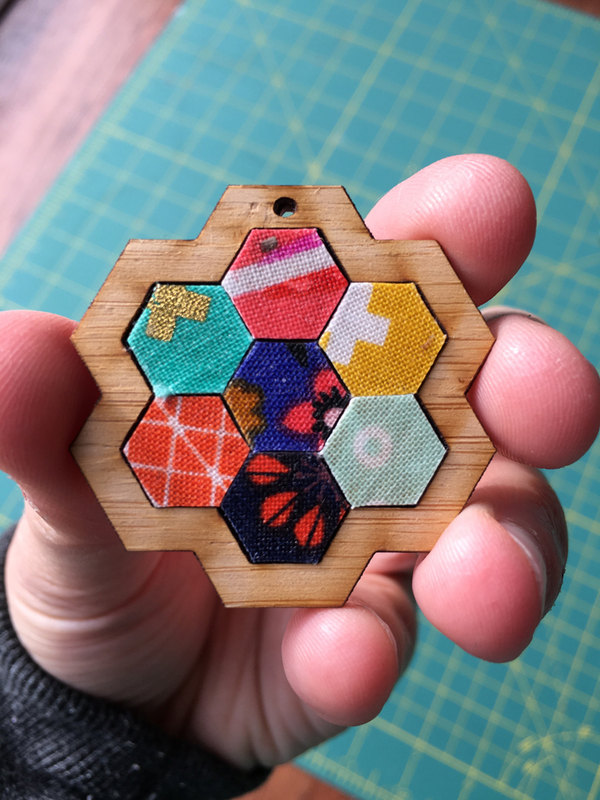 A few weeks ago I had an idea for a necklace with tiny, fabric hexagons. 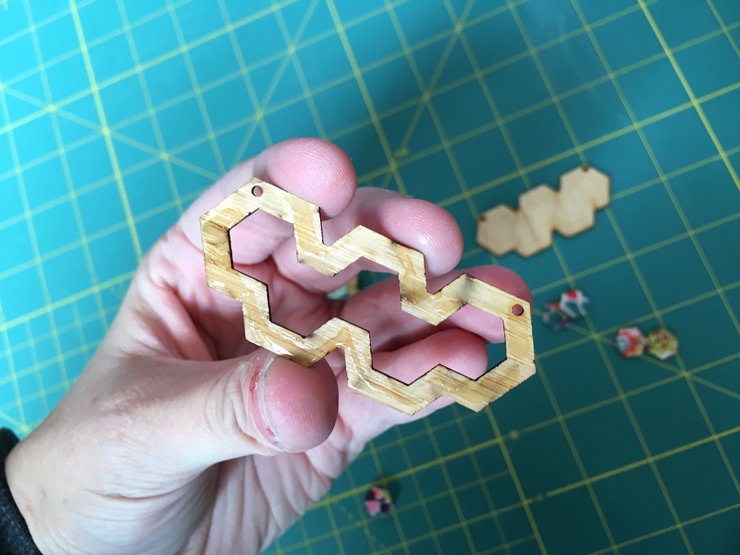 I had made some English paper pieced .25″ hexagons and they were absolutely adorable, but so light that I didn’t think they would work as a necklace. 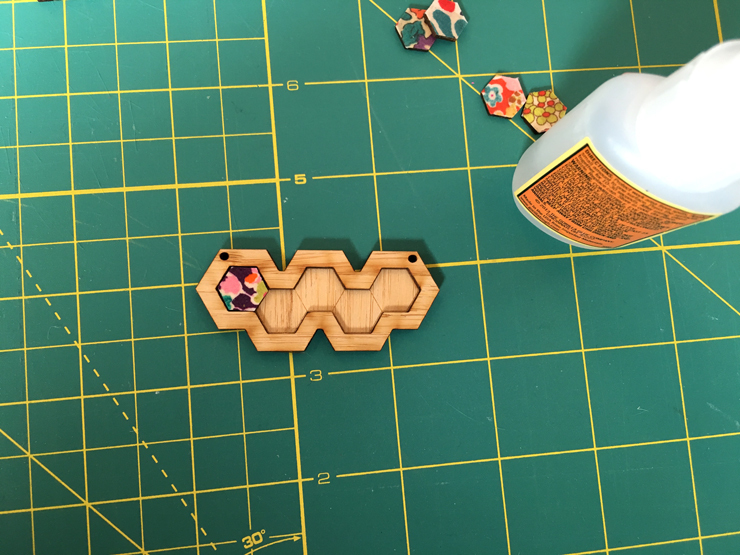 I turned to Jennifer from 52 Lasers with a laser cutting request and she produced an awesome pendant. Then when she dropped off the hexie flower design, she also gave me another version that is a bar with 5 hexies. I shared the necklace photo on Instagram and it got a lot of love. You can purchase the pendants directly from Jennifer in her Etsy shop Beadeux. 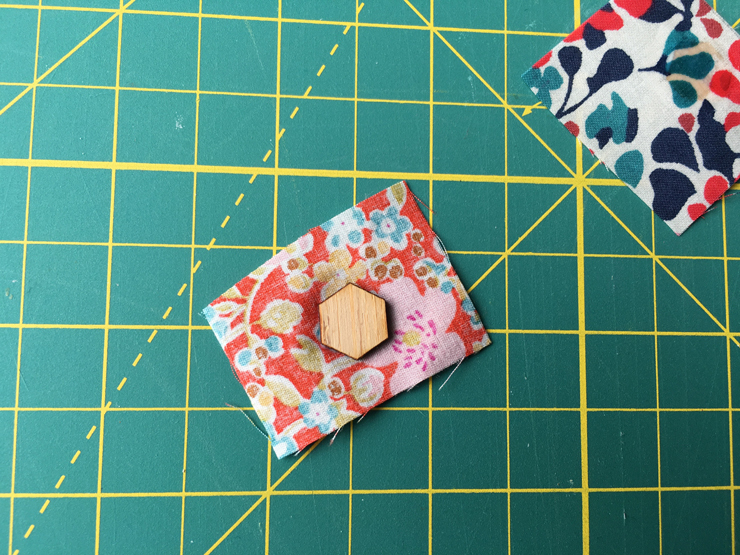 Here’s a quick tutorial on how to attach the fabric and assemble the pieces of the necklace. E6000 Craft Adhesive* or other super glue that is suitable for attaching wood. I’ve used both E6000 and Gorilla Glue and both seem to be equally secure. 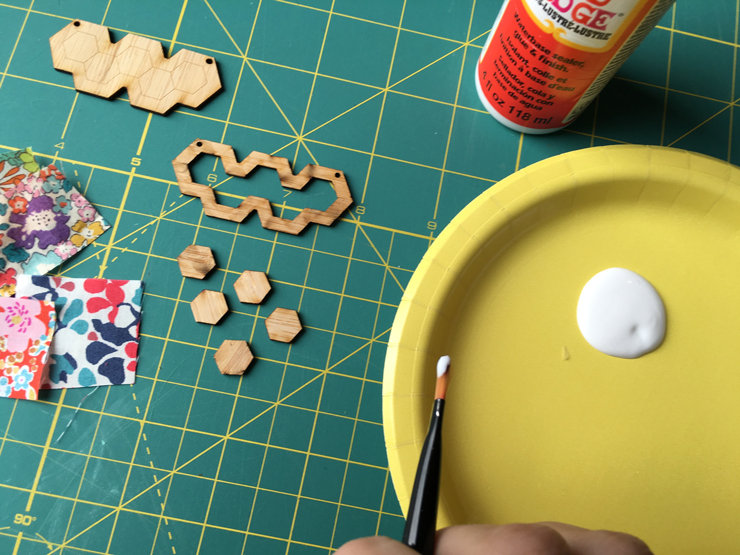 Start by applying a thin layer of Mod Podge to the hexagon with a paintbrush. Press the glue down on the wrong side of the fabric and smooth it down with your finger if necessary. 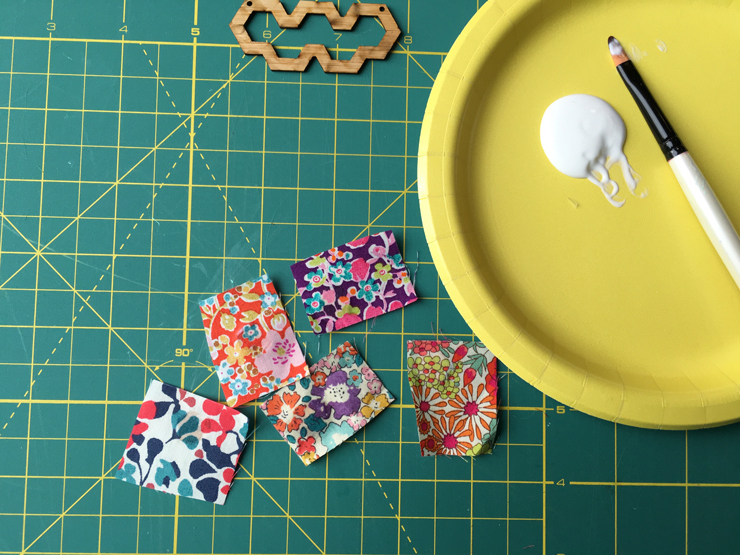 Turn the hexagon over and apply 2-3 thin, even coats of Mod Podge over the top of the fabric with the paintbrush. Allow each coat to dry before applying the next one. Now in a perfect world, once you’ve applied all the layers of glue you would let the Mod Podge cure on the fabric for 24 hours. However, if you’re anything like me, you will not be patient enough for that. For all of these I cut them as soon as the glue was dry and they all are fine. Place the fabric face down on a cutting surface and carefully trim around the edges with an X-ACTO knife. Get as close as possible to the edge of the hexagon. 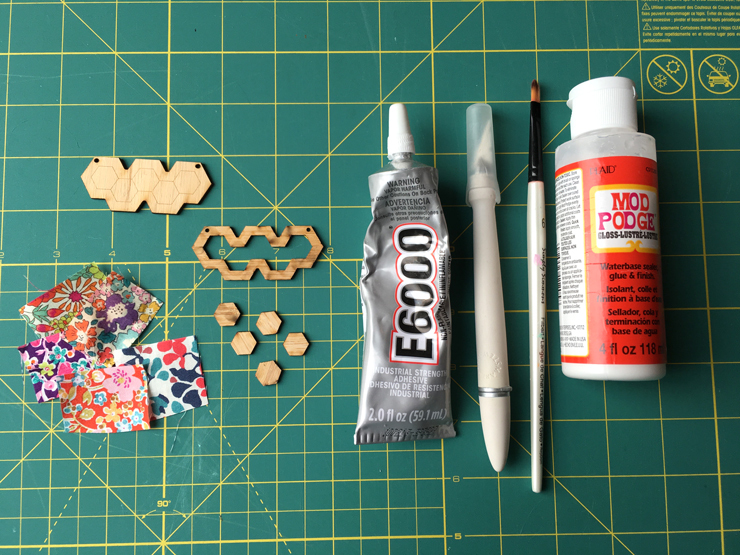 Apply a thin layer of the E6000 or whatever glue you are using to the frame of the necklace. Follow the directions on the bottle for instructions on how to adhere it. Carefully line up the holes on the frame and the backing piece and attach the two together. 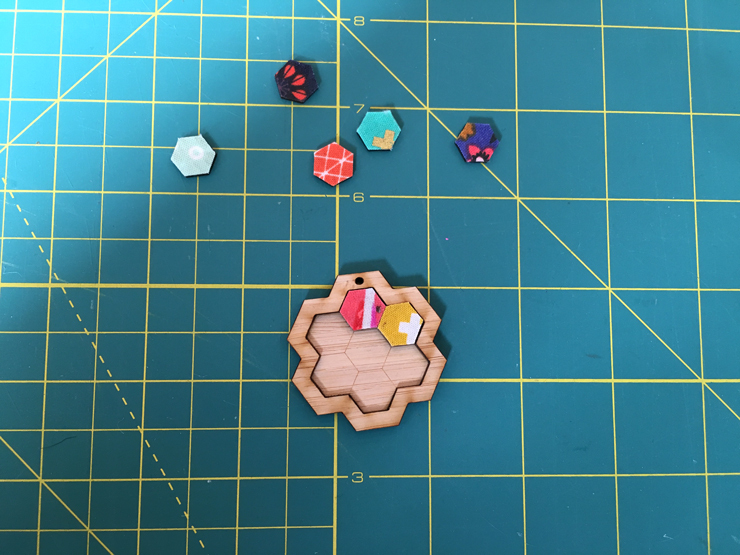 Apply glue to each individual hexagon and place them in each of the slots, working from left to right. 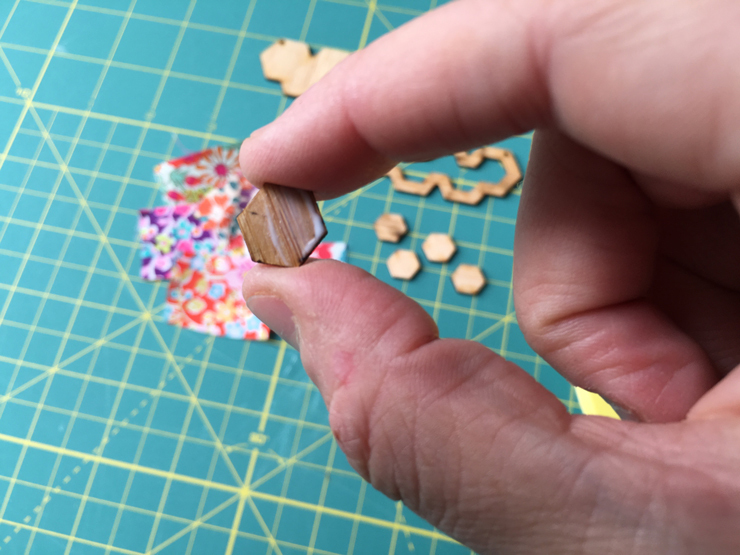 For the hexie flower pendant it is the same, but make sure that when you attach the hexagons you do not start in the middle. Choose on of the slots on the sides and attach them from the outside working in. And there you have it! Add a jump ring and a chain and you’re set to show off your quilty love. This is such a perfect project for using up the tiny scraps of your most precious fabric. 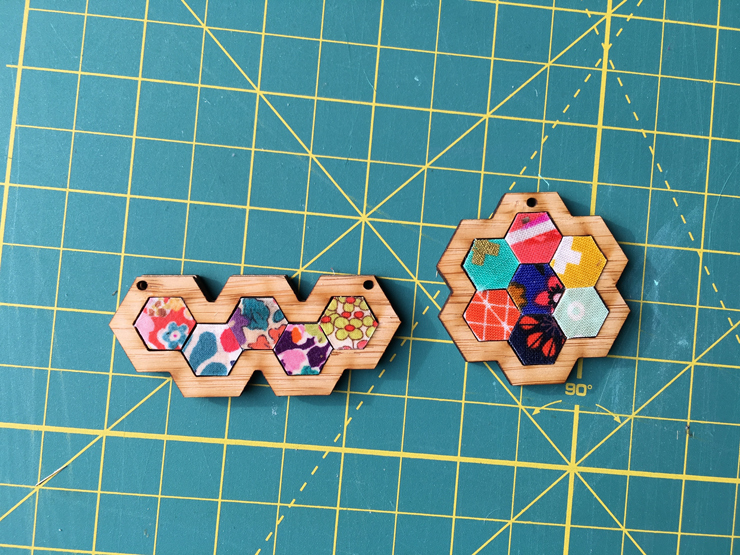 You can purchase your own laser cut flower hexie pendant here and the hexie bar pendant here.